How to Compress Big Video File Size with Handbrake Alternative? Can't fill up your phone or tablets with a bunch of big video file size due to the limitation of storage space on it? Wasting too much time to upload your favorite video to YouTube or other video sharing sites due to the large file size. When getting stuck in those conditions, you can shrink big video files down to smaller ones with a popular free application called Handbrake. As a free and open source multithreaded transcoding app, Handbrake has full compatibility with both Windows, Mac and Linux. It can comprehensively downsize various HD video files like AVI, WMV, MP4, MOV, MKV, etc to small ones. The following article will show you how to compress large large video file size with Handbrake on a PC computer. 2. Download click the downloaded file to install Handbrake by following the instructions on screen. 3. 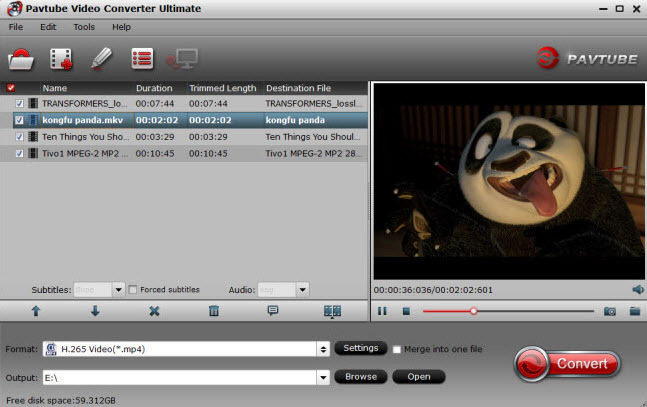 Launch Handbrake, click the "Source" button to browse and select the large video file you desire to compress. Tips: You are suggested to not change any of Handbrake's settings. 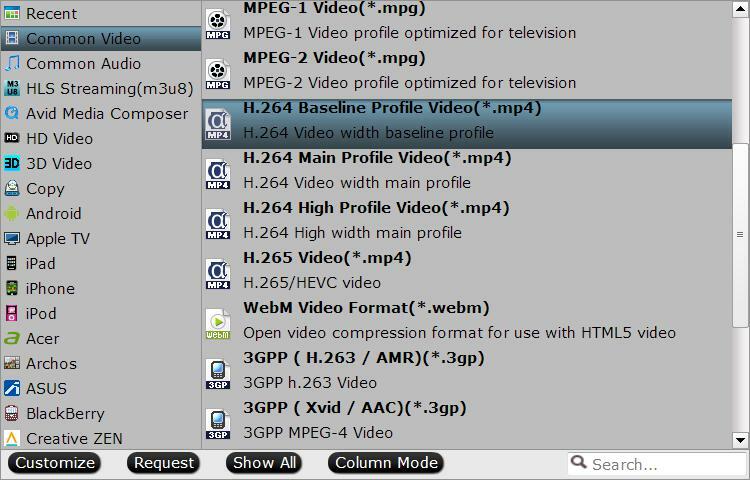 All Handbrake presets can easily configure Handbrake to transcode your existing large video files to something better suited for your device. 4.Specify a preset for your output profile. 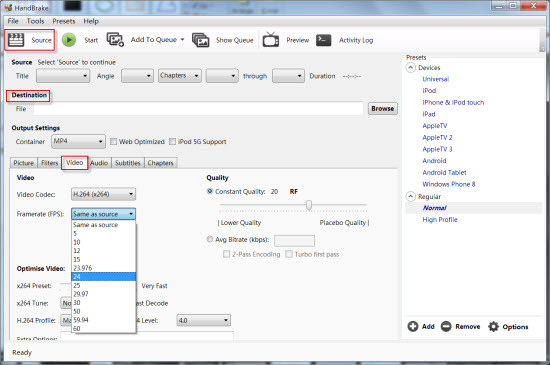 Handbrake offers 9 option under the Devices presets including Universal, iPad, iPod, iPhone & iPod touch, Apple TV, etc. Choose one according to your own preference. 5. Click "Browse" button to define an output folder to store the converted video file. 6. Hit on the green "Start" button on top-left to start the video compression process. The conversion time will depends on the size of your video file and the speed of your, when the conversion is over, you will get a video with much smaller file size. Although Handbrake has gained great popularity as a beneficial file size compressor, however, when people use Handbrake to perform video file size compression, they still encounter many errors such as no valid source found, video/audio out of syncing or other unexpected issues. If you are facing the same issue mentioned above and find no proper way to fix them effectively, a Hanbrake large file compressor alternative is recommended to you. 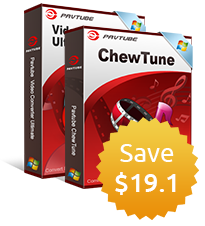 Pavtube Video Converter Ultimate for Windows/Mac (support Mac OS X El Capitan), a noteworthy video converted and compressor is capable of converting and compressing 4K UHD/2K/1080p large video file size like H.265, XAVC S, MXF, MP4, MTS, M2TS, AVCHD, etc to small file size in the file format of MP4, MOV with H.264 codec. 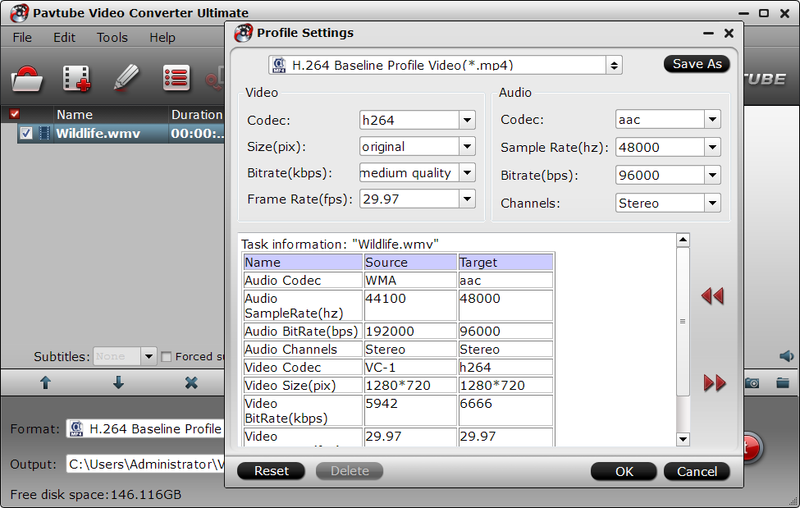 Besides that, the program also offers other bonus tools for you to minimize the final video file size. For example, you can use the trim function to cut out unwanted segments, lower the file resolution or bit rate of the output video. Apart from common digital file formats, the program also gives you to chance to compress Blu-ray or DVD to your desired file format or device preset profile formats. How to compress large video file with Handbrake alternative? Step 1: Load large video files to the program. Click "File" drop-down option to locate and select the files you want to compress. Step 2: Step 3: Define output file format. Other ways to reduce file size with Handbrake alternative. 1. Change output video resolution to a suitable file size such as 640 x 480 is more preferable by many portable devices such as iPhone, iPad, Android phone and tablet, etc and video sharing sites like YouTube, Facebook and Vimeo. Star the video file size reducing process by hitting the right-bottom "Convert" button. When the conversion is completed, you will get small size video for convenient storage, playing and sharing.